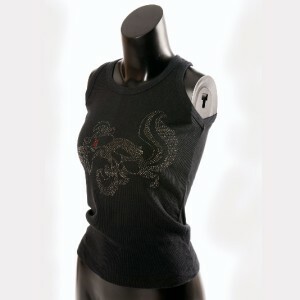 This 100%25 COTTON women's tank top is perfect for all ages! Soft and supple, this Warner Brother's design features the best romancer of all time, Pepe Le Pew, doing what he does best! This is officially the Most Interesting Skunk In the World, and while he doesn't always pose for tank top designs, we're happy to have him here today! This Valentine�motif is created through the use of silver and red colored tacks on a black ribbed background.